And did you like it? Hardly possible to miss I think. It kept me nicely busy for a few hours. Got some great examples, and this one is purely based on css and unnumbered lists in combination with anchors. Unfortunately the menu worked with non-classed <ul>, <li> and <a> tags. So embedding the css, caused my other elements to be redefined. (It even redefined the padding of all elements). But with some trial and error I got it working in a subclassed form. And I like it, do you? I also found that besides articles, you also can create pages in blogger. Did not know about that, completely overlooked that. I think I try something out, so if you're a regular visitor, you might find that there's work in progress. The wish for a menu popped up a little while ago, and I kept thinking about it, to be able to get some structure in my articles. From the beginning I tagged every article, but not with a real plan. So I got tags stating 'Oracle BPM Suite', but also 'SOA Suite'. And 'Database', but also 'Database 11g'. Not so straightforward and purposeful. But a purpose arose. For a longer while I'm thinking about if writing a book would be something for me. I like to write articles on a (ir)regular basis. On this blog you can find a broad range of subjects. But could I do a longer series on a particular subject? And could it lead to a more structured and larger form like a book? I learned from a former co-worker that he had this idea to write articles on a regular basis to buildup a book gradually. And I like that. But what subject would it be? My core focus area is SOA Suite and BPM Suite. But loads of books are written about that. Well, maybe not loads, but at least some recognized, good ones. And even PCS (Process Cloud Service) and ICS (Integration Cloud Service) are (being) covered. But when Oracle acquired Collaxa in 2004, I worked at Oracle Consulting and got to work with it in the very early days. And I think in the Netherlands at least, I was (one of) the first one(s) from Oracle to provide training on BPEL, at least for Oracle University in the Netherlands. So I got involved in BPEL from the first hour Oracle laid hands on it. Could BPEL be a subject I could cover? Of course I'll not be the first one to cover that. Both on BPEL 1.1 as on 2.0 you can google up a book (is that already a term? ), the one on 1.1 I still had stacked in a pile behind another one on my bookshelf. It might bleed to death. It might become a nice series and nothing more than that. And it might turn out a real informative stack of articles that could be re-edited into a book. But when I'm at it, turning to cover the more advanced subjects, I plan to pol for what you want to have covered. I think I do know something about BPEL. But as you read with me, maybe you could point me out to subjects I don't know yet. Consider yourself invited to read along. So how do we accomplish that? Today I got the chance to figure that out. Start with a JMS setup with a JMS Server, Module and a Queue with an Error Queue that is configured to be the error destination on the first queue. On the first queue set a redelivery limit to 3 and a redelivery delay on for instance 60000 ms (or something like that). I'm not going in to that here. Create also a Connection Factory in the JMS Module with a proper jndi, something like 'jms/myApplicationCF'. 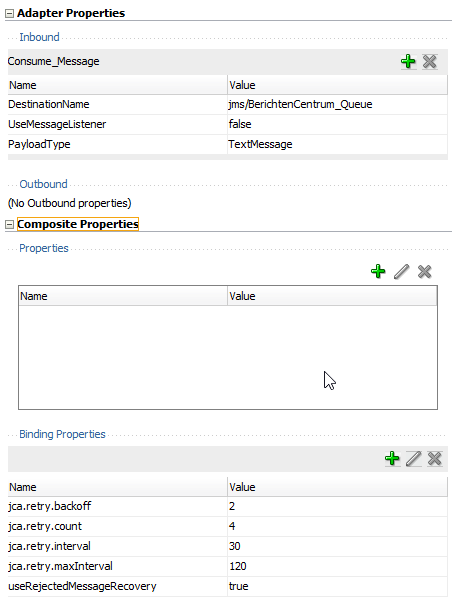 So create a new outbound connection factory, with a JNDI like 'eis/jms/MyApp'. Now, apparently we don't want 'AUTO_ACKNOWLEDGE', because that would cause the message-get acknowledged 'On Get'. So you could rollback until 'Saint Juttemis' (as we say in our family) but it won't go back on the queue. Dups aren't ok with me, so I'll choose 'CLIENT_ACKNOWLEDGE' here. Then there's another option: 'IsTransacted'. I want that one on 'true'. 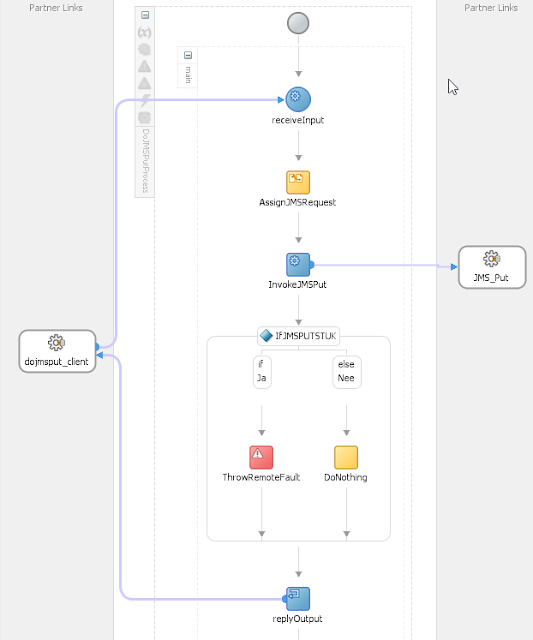 Then in ConnectionFactoryLocation, you'd put the JNDI of your JMS Connection factory, in my example 'jms/myApplicationCF'. 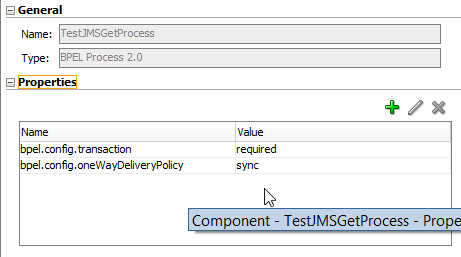 Having done that, you can update/redeploy your JMS Adapter with the changed plan. I figure that how to do that is straight forward, especially when you've done that with DB Adapters already. It assigns the request to the input variable of the invoke of the JMSPut. The JMS_Put is an jms-adapter configuration, referring to the JNDI 'eis/jms/myApp', defined in the JMS Adapter. After that there's an if on the action field, where in the case of a certain value a fault is thrown, to validate if the Put is rolled back. if there isn't, a new transaction is created. 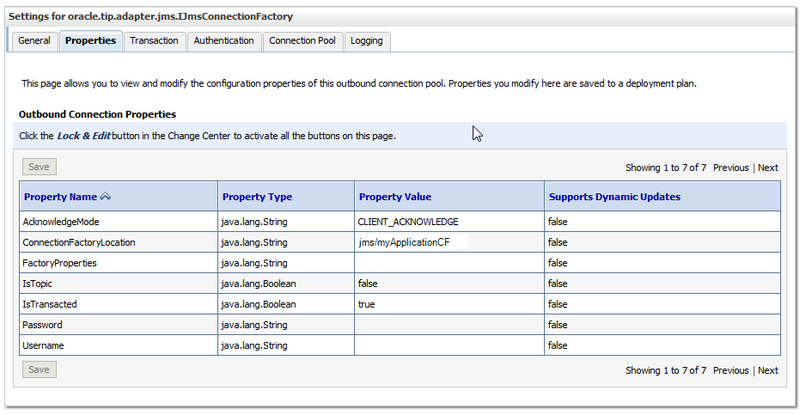 The JMS Adapter creates an new XA Transaction. On the JMS Adaptor on WLS we configured that no Auto Acknowledge should occur, and we want a transaction. Thus, this is the transaction that is re-used by the Mediator. But how about the BPEL? The BPEL is asynchronous request only. Since it has no way to reply the response, or it would be on a response queue. Here I have an if with a conditional throw of an exception as well. Based on the value of the action element I can have it to throw a custom exception, that will cause the BPEL to fail and the transaction rolled back. When I have a redelivery limit to 3, I'll get three retries, so in total 4 tries of the BPEL process. After that, the message is moved to the JMS Error Queue. I hope this article clears things up regarding the JMS Adapter configuration for transactions. 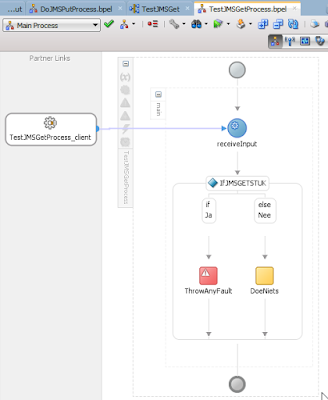 Lately I wrote about how to install RealTime Integration Business Insight. It's about installing the software, actually. In the quickstart you'll read that you actually have to extend your domain as well. It actually states that you can install it in your SOA QuickStart installment as well, but I didn't try that (yet). To do so, shutdown your domain (if not done so), but (as I found needed) start (or leave it up) your infra database. Click Next, Next, ... Finish. If you would have checked the 'Deployments' checkbox under the Advanced Configuration, you could have reviewed that the particular deployments are automatically targeted to the BAM, OSB and SOA clusters. After this you can start your servers and start using insight, for example beginning with the Set up of the Insight Demo Users. This is properly described in the Quickstart Guide. But, as I'm on to it, let me try right a way. The demo users setup is downloadable here. Download it and unzip it in a folder on your server. The first one is not set by my script (I called it $FMW_HOME), so I needed to set $MW_HOME to $FMW_HOME, the last three are set by my script. Running the script with a developer topology domain (everything in the AdminServer or DefaultServer in the SOA QuickStart) will probably go ok. But a stuborn guy as I am tries to do this in a more production like topology with seperate SOA, OSB and BAM clusters. 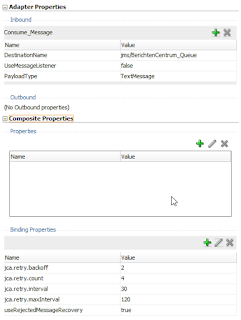 So it turns out that you need to adapt the insight.properties that is in the bin folder of the InsightDemoUserCreation.zip (also when you're not like me, you'll need to review it...). After restarting BAM all went well, except for the exceptions indicating that the users were already created. 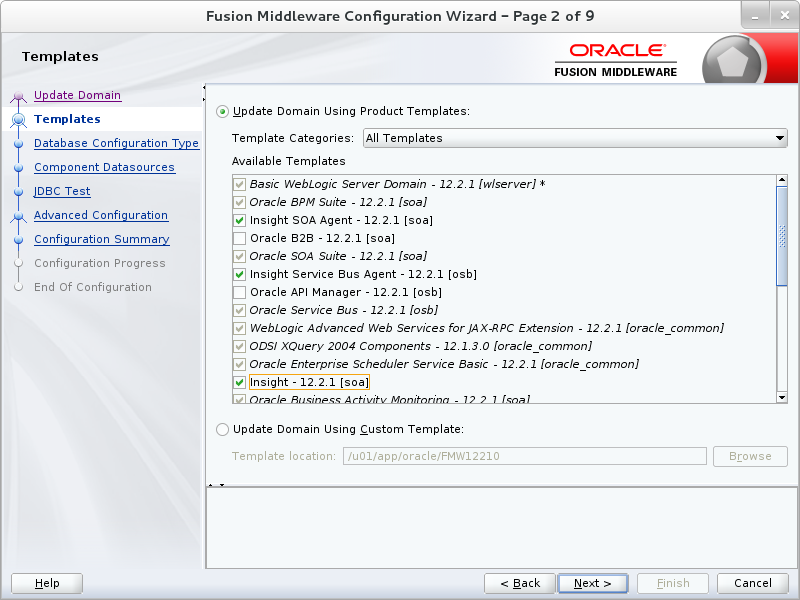 Yes, Oracle FMW Integration Insight is available, as I wrote in an earlier post. You can download it here. Following the README.txt in the zip the correct order is to first install ORIBI and then patch SOA&BPM and then SB. This provides the settings to the FMW_HOME and the JAVA_HOME. And the product homes I needed for my SOABPM Suite installation (I definately should write that down!). echo $OII_INSTALL_HOME/$OPATCH_OII_ZIP does not exist! echo $OII_INSTALL_HOME/$OPATCH_SOABPM_ZIP does not exist! echo $OII_INSTALL_HOME/$OPATCH_OSB_ZIP does not exist! Then it performs 'md5sum -c patches.MD5' to checks on the zips, but it ignores the results, just prints them. Then for each patch it checks if the patch is already unzipped in the FMW_HOME/Opatch/patches folder. If so, it just assumes that its applied as well. If not the patch-zip is unzipped in the patches folder. And then it will perform opatch apply. OPatch detects the Middleware Home as "/u01/app/oracle/FMW12210"
If you have a home with only OSB or only SOA-BPM adapt the script yourself to not patch the not-installed product. Oh, I did not check on the install, for now I assume it worked. 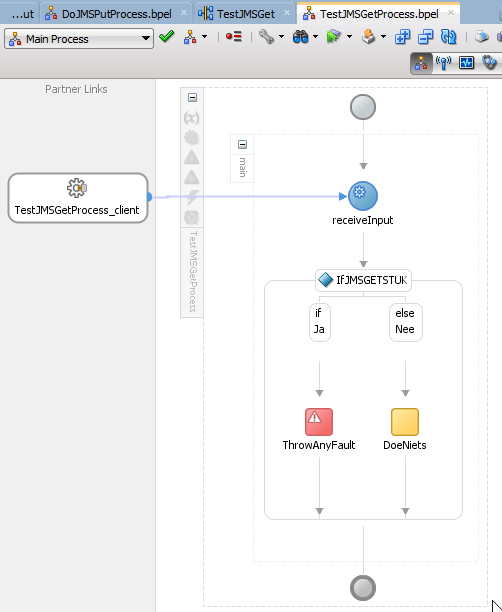 Next step for me is describe the SOA/BPM install and check-out on the Integration Insight product.